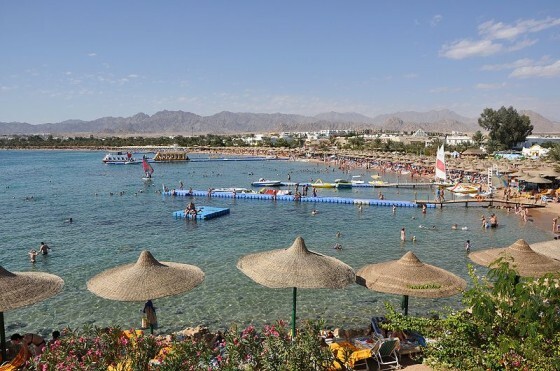 Egypt’s Ministers of Environment and Tourism signed a tripartite agreement with the South Sinai governor to convert the popular Egyptian diving town Sharm el-Sheikh into a bonafide green city by 2020. The $.25 million deal signed by Dr. Mostafa Hussein Kamel, Minister of State for Environmental Affairs, Mounir Fakhri Abdel Nur, Minister of Tourism and Major General Khalid Fouda, Governor of South Sinai earlier this week lays out a comprehensive plan for implementing a whole series of steps that will protect the country’s crown jewel of tourism. More details after the jump. Under the terms of the new protocol, a new Technical Committee will be set up to establish the best steps needed to convert Sharm el-Sheikh into a more sustainable operation. At present this Red Sea resort is a valuable source of tourism dollars, but poor environmental oversight has resulted degraded coral reefs. The presence of trash in the water, on the beach and elsewhere is also a huge turn-off for visitors. A new Technical Committee is responsible for developing management strategies based on the recently signed protocol while a High Committee will be tasked with putting those strategies to the metal to ensure the successful completion of this transition. Developing a sound liquid and solid waste plan – better late than never we suppose. Incorporating renewable energy into the town’s grid. Egypt appears to have woken up to the idea that eco-tourism has necessarily surpassed the tired old mass tourism model that eroded so many beautiful and often archaeologically important sections of the country. As more and more cities in the country take such bold moves, the momentum will grow. Then Egypt will be unstoppable! 52% of the funds will be derived from loans and aid, 42% will be privately funded, and only 3% of the tourism dollars being generated. I agree Kat! A better tourism model could have such a profound and long-lasting impact. Please let there be a positive change here. Especially with regard to tourism.